Trying to come up with my PGM-style framing rite was pretty fun, I have to admit. Scouring the entire PGM for things that fit a pattern I work in, trying to select the best or most appropriate verses to use to make sure they’re generic enough to not step on toes while still being specific enough to function for a purpose, and seeing what was really needed and what wasn’t as far as potential options go helped me get an even deeper realization of the abundant (yet never enough!) 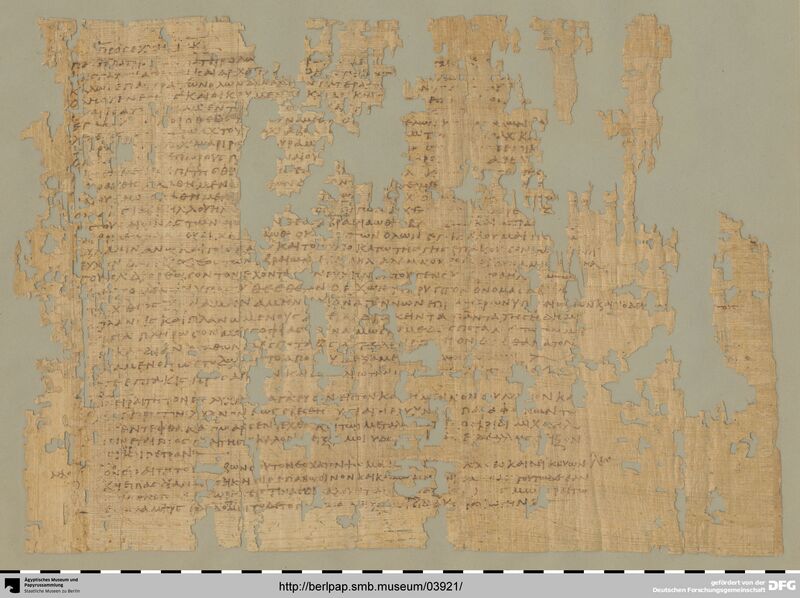 material available to us in the Greek magical papyri. Still, there were some design decisions that I had to make about what to include and where. In the end, I decided to make the framing rite as general and flexible as possible, making lots of things optional rather than just not having them in there (and being asked about it later, or forgetting myself where something might best be placed). One of the ritual acts that I made optional was a general burning of incense, after the empowerment and just before the ritual proper around which the framing rite takes place. Personally, I love the use of incense, and I don’t do many rituals without it; I typically find it to be an important, if not outright essential, part of ritual magic, and there are too many rituals in the PGM to count that use some sort of suffumigation or another. The problem is, though, the use of incense generally outside of a ritual for its own sake. Looking through the PGM, whenever incense is burned, it’s for a specific purpose, generally to bless a particular object or as an offering. Incense doesn’t seem to be used for its own sake, whether as a general perfume, a spiritual resonance-tuning method (getting a place more into the “feel” of a particular sphere or spirit), or a method of blessing or purifying a space (a la smudging), which are all pretty common modern uses of incense. Rather, the use of incense appears to almost always be used as an offering to some god or spirit, or as a suffumigation to bless a particular object under a particular god or spirit. These acts are intrinsically and intimately bound up with specific rituals, and no one method seems to cover most of them; because of this, I decided against having a general incense burning before the ritual proper in the framing rite. Anyway. While looking through the PGM for topics and sections involving the use and types of incenses, I came across (once again) the Eighth Book of Moses, split and replicated in several forms in PGM XIII, sections 1—343, 343—646, and 646—734. These sections precede the section PGM XIII.734—1077, which calls itself the Tenth Book of Moses, which is also the source of the Heptagram Rite (and, thus, the Calling the Sevenths or Heptasphere ritual that’s so common in modern PGM-forms of magic). Taken all together, PGM XIII presents a fascinating self-initiatory form of magic coming into some of the highest and most glorious powers of the cosmos, and presents an interesting blend of Egyptian and Jewish priestly practices. One of which is the use of incenses, described in the earlier parts of PGM XIII, which is used both as an offering substance for the divinity or divinities invoked in the ritual as well as an ingredient for consecrating particular inks and drinks in the ritual. Despite the common modern use of styrax (or storax) to refer to benzoin (Storax officinalis, storax or cowbell), this was most likely instead the resin of Liquidambar orientalis, oriental or Turkish sweetgum, a type of balsam which was well-known in classical and medieval times. However, given the ambiguity of this term, either may be meant. This is an older name for the leaves of Cinnamonum tamala, more commonly known as Indian bay leaf, tējapatta/tejpat/tejpata, tamalpatra, tamaala, vazhanayila, edana, pattai illai, or bagharakku in various Indian languages. Betz also gives Cinammonum albiflorum as an option, but it seems like this is just a synonym for Indian bay leaf. Sassurea lappa, also known as saw-wort or snow lotus. The dried root was an important and well-known trade item between Rome and India. Currently listed as endangered, making it illegal to dig up the plant for export, so trade of this plant is highly regulated. Boswellia sacra, our gold old friend. Pretty straightforward here. We all know and love this stuff. Nardostachys jatamansi, spikenard, which was a luxury item in the Mediterranean. Cinnamonum cassia, the usual cassia or Chinese cinnamon. The bark of the plant is as available today as it ever was, and most store-bought cheap “cinnamon” tends to be cassia, anyway. Commiphora myrrha, the resin of the plain old myrrh. No further explanation needed. The spelling for this is weird, using an initial zēta instead of an initial sigma, but so it goes. Likely explainable due to voicing from the following mu. In addition, PGM XIII.1—343 says that one should “prepare sun vetch on every occasion”, meaning the “Egyptian bean”. Here, it’s most likely referring to Vicia faba, or the simple fava bean, still a staple in Egypt to this day. Another option might be bitter vetch, Vicia ervilia, which was domesticated before fava beans by about 1500 years, but I’m inclined to think that fava beans are meant here. However, it’s unclear whether it’s the bean itself to be used or the leaves or flowers of the plant instead. The initiation called The Monad has been fully declared to you, child. Now I subjoin for you, child, also the practical uses of this sacred book, the things which all the experts accomplished with this sacred and blessed book. As I made you swear, child, in the temple of Jerusalem, when you have been filled with the divine wisdom, dispose of the book so that it will not be found. Then the Lord said to Moses, “Take the following fine spices: 500 shekels of liquid myrrh, half as much (that is, 250 shekels) of fragrant cinnamon, 250 shekels of fragrant calamus, 500 shekels of cassia—all according to the sanctuary shekel—and a hin of olive oil. Make these into a sacred anointing oil, a fragrant blend, the work of a perfumer. It will be the sacred anointing oil. Then use it to anoint the tent of meeting, the ark of the covenant law, the table and all its articles, the lampstand and its accessories, the altar of incense, the altar of burnt offering and all its utensils, and the basin with its stand. You shall consecrate them so they will be most holy, and whatever touches them will be holy. We know that the Talmudic literature and traditions go back to the destruction of the Second Temple in 70 CE, and so its beginnings would have been roughly contemporaneous with the PGM authors. If the Talmudic/rabbinical recipe list given above can be considered something approximating or reflecting actual Jewish practice at the time of PGM XIII’s inception, then we basically have the entire list of incenses given in PGM XIII. The only odd one to consider is malabathron, which is not listed in either the Exodus or Talmudic recipes; however, knowing that it’s considered close to cinnamon, which we lack in our PGM incense list (except as a phylactery or charm to wear around the neck—perhaps too precious or expensive to be burned? ), it could be seen as a reasonable substitute for cinnamon, and some rabbinical scholars suggest that it could indeed have been used in place of actual cinnamon. There are other Jewish influences in PGM XIII as well, such as how the ritual is to be done such that the 41 days of purification ends with the New Moon in Aries. This is basically ensuring that you’re timing things to line up with Passover, which generally occurs around the Full Moon in Aries. That said, the ritual as a whole is really more of a priestly Egyptian kind of magic with Jewish elements mixed in. This reaches its pinnacle in the idea that one has to receive “the Name” from the “god who comes in” via the initiation; this is that god’s own True Name, which is sacred and powerful and is used in many of the works that follow the initiation in PGM XIII.1—343; this can be seen to also bring in some of the influence of the Divine Name of God, only permitted to be spoken aloud once a year by the high priest in the holy of holies of the Temple. Origanum majorana, sometimes called sweet marjoram or knotted marjoram to ensure it’s kept distinct from oregano which can sometimes be called “marjoram”. Another species, Origanum onites (Cretan oregano or pot marjoram) could be substituted, but all indications point to it being marjoram proper. The word used here is not the usual Greek word for marjoram, but specifically a “foreign name”, while the usual classical Greek term would be ἀμάρακος (amárakos). Betz gives “white lily”, though this is not mentioned in either Preisendanz or the original Greek. Indeed, “white lily” would have been referred to by λείριον and not the word used in the PGM, while this word here refers to non-white lilies. I’m not quite sure what a good species would be, but so long as it’s a non-white true lily like Lilium chalcedonicum or Lilium martagon (Turk’s cap) or even Lilium bulbiferum (fire lily). Lots of options here, but most likely is Nymphaea lotus, also called white lotus or Egyptian lotus (unsurprisingly), and was revered in ancient Egypt as a symbol and medicine of strength and power, though it could also be the blue Egyptian lotus, Nymphaea caerulea. This name is unknown and nobody seems to be sure what this name refers to. Preisendanz gives “Dichtlaubpflanze (? )”, literally “thick-foliage plant”, so he’s not sure, either, though he also gives a possible alternative ἑρπύλλινον “herpullinon”. If I translated it right, this word refers to tufted thyme, Thymus caespititius, and unlike many of the other plants which come from the Near East or South Asia, this one is native to Iberia. The author may instead be referring here to Thymus capitatus, conehead thyme or Persian hyssop, and is native to the Mediterranean and Turkey, so it’s possibly more likely. This is just daffodil, most likely the type species Narcissus poeticus. “Gillyflower” confused me, but Preisendanz gives “Goldlack” as the name in German, which refers to Erysimum cheiri syn. Cheiranthus cheiri, or common wallflower. It’s…it’s rose. If one wanted to get really particular, I’d recommend the Damask rose, Rosa × damascena, which seems to have been cultivated in the classical world and is prized for both its fragrance and flavor. Though these seven flowers are said to be “of the seven stars”, no association is made explicit between these and the planets. The order of the incenses might be temping to use as a correspondence, but there are two orders given both for the incenses and the flowers between PGM XIII.1—343 and PGM XIII.343—646, so I’m not comfortable linking them up that way. It’s possible to deduce some planetary rulerships, but I’m unclear on what sources to use; most modern resources would give multiple flowers to Venus (lily, rose, narcissus, and thyme), leaving not many for the other planets. For that matter, the planetary patterns of the incenses, too, are unfamiliar to modern magicians. It’s possible that they would be mixed-up as a blind, but I’m disinclined to think so; what few blinds there are in the PGM are code-names for particular materia magica (e.g. PGM XII.401—444), but beyond that, it’d be odd for blinds to be introduced in what are little more than personal notes or examples that were never probably meant for public dissemination. All told, I’m not sure we can clearly identify which flower goes with which planet, but at the same time, I don’t think it’s needed; unlike the incenses, there never seems to be a use for individual flowers, but they’re to be mixed up and used as a single substance. According to the directions in PGM XIII.1—343, these seven flowers are to be taken 21 days “before the initiation” for processing. The timeline given in the ritual suggests that a pre-initiatory period of sunrise salutes begins on the New Moon for seven days leading up to the initiation, which then would make the initiation occur on the First Quarter Moon. 21 days before this, then, would mean to gather the flowers on the day of or just before a Full Moon. The text says that the flowers, once picked, are to be ground finely either in a white mortar or into a white incense (the Betz translation gives two options for this), then left to dry in the shade. However, I’m not sure this makes sense; given the colors of the flowers, grinding them “into white incense” doesn’t seem likely or possible, nor does it make sense to grind them up before drying them if they need to be ground fine into anything except a paste or mush. Still, perhaps that’s desired; if they are to be mixed up, perhaps making a single mass of them and letting them dry in the shade (protected from the light of the Sun and the Moon and other stars) could be more effective than letting the flowers dry out first then grinding them up into a powder. The directions further on in PGM XIII.1—343 suggest that the the seven flowers was to be mixed with the appropriate planetary incense into a “bean”, a small nugget of incense, which was then to presumably be burned; later, the incense and the powder of the seven flowers is to be used when making ink for writing on a special tablet of natron before washing it off in wine and drinking the wine. PGM XIII.343—646 suggests that, as a general initiatory incense, all seven of the planetary incenses were to be mixed with the the seven flowers, along with unmixed wine; additionally, the seven flowers are to be mixed with ink in the same way as before; though no reference is made here to using the incense as well for this purpose, PGM XIII.646—734 does say to use both the incense and the flowers for the ink. The use of the flower powder and the incense for making ink is outside the scope of this post, since I want to focus on the process of making the incense. As said above, the end of PGM XIII.1—343 says that the powder of the flowers is to be mixed with the incense and, presumably, sun vetch (fava beans) into nuggets of incense. Making pellets like this is something I’ve done before, and was definitely done in the old world as well; while burning a combination of resins works, mixing them ahead of time along with a filler to produce more, thicker, or brighter smoke was often done as well. However, some sort of liquid would be needed in order to steep and soften the resins and barks in order that they can be ground up; indeed, PGM XIII.646—734 says that, “having ground them all to a powder” (meaning both the flowers at minimum and likely also the incenses), one is to add “wine not mixed with seawater”. This would moisten the incenses and flowers together, allowing them not only to be more fragrant and pungent, but also giving a bit of sugar to it as well, which would help the incense smoke more; the specific note of “not mixed with seawater” suggests that white wine would have been the preference, which would also line up with the Talmudic use of Cypriot or old white wine, dry and with a greater acidity, for the Temple incense. The use of fava beans would then act as a binder and filler, giving the incense nuggets as a whole an earthy base to solidify on and would help stretch the use of scarce or expensive ingredients. The process of soaking and mashing the ingredients, plus curing the nuggets once made (say, in a terracotta or clay container), would indeed take about three weeks, giving the magician enough time to have them ready by the time they were to be used. What we end up with, essentially, is a type of PGM-specific kyphi, the sacred incense compound used in Egypt for both religious and medicinal purposes, which was also a blend of a variety of resins, flowers, barks, and so forth, many of which according to ancient authors are found in our ingredients above (and which, of course, have overlap with the incense and oil recipes given by the Book of Exodus which may also have been influenced by ancient Egyptian priestly practices). Given the Egpytian priestly influence in PGM XIII, and the fact that we see the use of this incense both as a form of fumigation as well as a type of sacred medicine (when the ink used to write on the natron tablet is either licked off or washed off into wine and drunk), it’s clear that PGM XIII is really giving us a special type of Hermetic kyphi recipe. Quantities, unfortunately, are missing from PGM XIII (as they often are from much of the rest of the PGM), so it’s unclear exactly how much of each incense or flower we should use, the ratio of incense and flowers to beans, and so forth, so some experimentation would be needed to come up with something that would resemble the incense of PGM XIII. Off the top of my head (and I could be really wrong about it), I’d probably think a 2:1:3 ratio by weight would be appropriate for resins to flowers to beans, all having been soaked ahead of time in dry, strong white wine that is, of course, with no salt or salt water added. Moreover, finding these ingredients can be hard; expensive perfumery is as expensive as ever, and while all the ingredients are still technically available, the fact that some of the ingredients (like costus and, increasingly, frankincense) are considered endangered makes getting hold of sufficient quantities exceptionally difficult. It is possible to replace the use of raw resins and barks (and even the flowers, too!) with essential oils instead, which could then be used for both making incense (when mashed with fava beans soaked in wine) as well as making a PGM-style anointing oil. I think I’ll keep an eye out for getting some more flowers later this summer. It’s unclear how close to what the PGM author and I’ve described I can get, but it’s probably worth a shot. Having a PGM-style temple incense (and maybe even an oil, if I were to go the essential oil route, or simply distill the resins and flowers into an oil without the wine and fava beans) could be useful, indeed. A few weeks ago, I made a post about an idea about working with a Greek style of Hermetic qabbalah, tentatively calling it kambala (Greek way to write out qabbalah from Hebrew) or to Paradedomenon (lit. “that which is handed down”). The idea, I claim, is an interesting one: in the absence of Hebrew kabbalah, is it possible to make a Hellenic style of emanationist cosmological magic and theology that works with the Greek letters as magical units and entities in their own right? Asked another way, could there conceivably be such a thing as a Greek qabbalah? So I started thinking about it, and I first went and looked up translations of the names of the sephiroth and the like from Hebrew into Greek, and started translating other names into Greek as well, and also rewriting the magic number squares of the planets using Greek letter-numerals to develop new planetary spirit names. Now I’m thinking I was going down the wrong path and need to start fresh without using the Tree of Life, or even using Jewish kabbalah at all. I mean, what is Jewish kabbalah? It is a deep, powerful, multifaceted, beautiful system of Jewish mysticism that can deliver one great, perhaps infinite, knowledge and power through the proper use of its system, but it’s still at its heart a Jewish system. Thus, it is Jewish, and geared towards those who are Jewish: not only by blood (as tradition would have it), but also by culture (having the means and faculties available to a proper Jew) and definitely by religion and religious studies. Kabbalah is really only meant for those who are prepared to study it, which requires a deep and thorough study of the Tanakh, Talmud, Midrash, Mishnah, and so many other aspects of Jewish religion and how it ties into Jewish life. For all intents and purposes, to get the most out of kabbalah, you have to be Jewish. You don’t necessarily have to be a Jew (unless you’re so hard-core traditionalist that only the first-born son of a kabbalist can learn it from his rabbi father), but you definitely have to be Jewish in order to properly study kabbalah. Anything less, and you’re not going to be able to use it as much as it can or ought to be. As for me? Sure, I can claim descent as a Jew, but I’m about as Jewish as an Olive Garden is Italian, which is to say “hahaha not really”. Sure, I can say the berakhah for Chanukah, and that’s about it. I’ve never had my bar mitzvah (even though my father has idly wondered that we should probably get ours done eventually at the same time), and it’s more likely that I’ll be baptized into Christianity before having a bar mitzvah. I’ve only read the Old Testament in English, not even in the proper order of the books that the Tanakh would have; I don’t maintain kosher standards of purity or cleanliness (especially not with the occasional use of blood rum), and I can’t even read or speak Hebrew. In all honesty, for me to properly study kabbalah, I’d need to learn Hebrew, get bar mitzvah’d, and undergo what’s likely to be many years of studying before I even read properly about the sephiroth. Which is why I’m not, nor will I ever, learn about Jewish kabbalah outside a few books by Aryeh Kaplan. But of course, that’s not the only way to study the Tradition. What about Hermetic qabbalah (this time with a Q)? I’ve been making good use of that, to be sure, as have many others in the Golden Dawn, Thelemite, and other modern Hermetic movements, and heck, even in a good number of neopagan movements I’ve seen that are influenced by Gardnerian Wicca and the Golden Dawn. While I’d argue that the heart of Hermetic qabbalah and Jewish kabbalah is the same (it provides a means to understand the source of an emanationist panentheist cosmos by means of a cosmological Abrahamic structure), the study of the two nearly couldn’t be further apart. And, to be honest, after mulling it over some, I’m not sure Hermetic qabbalah is even recognizably able to achieve the same goal as Jewish kabbalah. My good friend the Rev. Michael Strojan has compared Jewish kabbalah to a beautiful rose garden maze leading to a unique spiritual experience of the mind of God in creation, while Hermetic qabbalah is a far more rational, utilitarian cosmological mapping. In fact, when a Hermeticist tends to refer to “qabbalah”, they’re usually referring to the specific teaching of the Tree of Life, the linking of the ten sephiroth with 22 paths in a particular geometric array. In Hebrew, this is known as the upright arrangement of the sephiroth, or “yosher”, which is one way to view the sephiroth; the other is “iggulim”, or “circles”, viewing the cosmos as a series of nested circles with God on the outside and Malkuth in the innermost circle. I’ve seen a similar way to represent the sephiroth before in Hermetic qabbalah, but only as an introduction to emanationist principles and never for serious magic or prolonged study. While the paths of the Tree of Life are important, they’re usually grossly understudied in favor of the sephiroth themselves; I’ve seen plenty of people talking about scrying the spheres but next to nobody about scrying the paths, and I admit that I’m guilty of this, too! It’s nearly all about corresponding things to the ten spheres, and that’s about it. Consider Yesod, the ninth sephirah: Yesod is associated with the first heaven, which coincides with the sphere of the Moon, so anything lunar can be corresponded to Yesod. That’s nearly about it in Hermetic qabbalistic framework, it’d seem, unless I’m missing a large amount of the cultural movement and study of the thing. I’m aware that many Hermeticists have gone in much deeper study of the sephiroth and the paths, but I wouldn’t call them a majority. To most magicians who use Hermetic qabbalah, they only use it as a system of correspondences. This wisdom hath its foundation in the high and holy Qabalah which is not granted unto any other than unto the first-born, even as God hath ordained, and as it was observed by our predecessors. Thence arose the difference, and the truck or exchange between Jacob and Esau; the primogeniture being the Qabalah, which is much nobler and greater than the Sacred Magic. And by the Qabalah we can arrive at the Sacred Magic, but by the latter we cannot have the Qabalah. Unto the child of a servant, or of an adulterer, the Qabalah is not granted, but only unto a legitimate child; as occurred in the case of Isaac and Ishmael; but the sacred wisdom through the mercy of God all can acquire, provided that they walk in the right path; and each one should content himself with the gift and grace of the Lord. And this must not be done out of curiosity, and with extravagant and ridiculous scruples, wishing to know and understand more than is right; seeing that temerity is certainly punished by God, who then permitteth him who is presumptuous not only to be turned aside out of the true way by the Second Causes, but also the demon hath power over him, and he ruineth and exterminateth him in such a manner, that we can only say that he himself is the sole cause of his own ruin and misery. It is certain that the Old Serpent will attempt to contaminate the present book with his venom, and even to destroy and lose it utterly, but O Lamech! as a faithful father I entreat thee by the true God who hath created thee and all things, and I entreat every other person who by thy means shall receive this method of operating, not to be induced or persuaded to have any other sentiment or opinion, or to believe the contrary. Pray unto God and ask him for his assistance, and place all thy confidence in him alone. And although thou canst not have the understanding of the Qabalah, nevertheless the holy guardian angels at the end of the six Moons or months will manifest unto thee that which is sufficient for the possession of this Sacred Magic. Is there a means for us to study divinity and obtain power and knowledge thereby? Of course! The Word of God is something all humans with ears can hear (as much of my 49 Days of Definitions project indicated), but not every word is meant for us. There are many words out there for us to understand the Word; they are all the Word, but not using the same words. In a Hermetic sense, kabbalah is a form of Logos for the Jews who are able and allowed to study it. So, while a Hermetic qabbalah with roots and liberal borrowing from the Hebrew kabbalah is not improper, strictly speaking, it does seem like trying to borrow a prayer in another language to another divinity and speaking it aloud with a bad accent to your own. To be terse, the more I look at it, the more Hermetic qabbalah looks like cultural appropriation, and knowing how rife much of the Golden Dawn material was with culturally appropriated techniques and technology, this isn’t too surprising. Besides, while Jewish kabbalah is definitely Jewish, it’s not entirely Jewish. It’s apparent that there was much cross-pollination between Jewish and Neoplatonic thought back in the days of the Roman Empire, especially after the Jewish Diaspora after the destruction of the Second Temple, and it was only then did the Hebrew alphabet begin to be used as numbers in addition to letters, a notably Greek practice that had already been in place for centuries, along with the Greek practice of isopsephic exegesis in interpreting words as numerical strings and linking them to numerological concepts and other words by means of isopsephy. Heck, even the Hebrew word “gematria” has its origins in Greek “geometria”. It might reasonably be said that what is today Jewish kabbalah is a combination of Greek Neoplatonist philosophy and isopsephic techniques combined with the native Jewish Merkava and Hekhalot mystic techniques. This was used, then merged again with other European thought as the centuries passed, so that kabbalah borrowed and reborrowed other philosophies just as it was borrowed and reborrowed from. As a magician in the vein of Neoplatonism, I can definitely see much that I resonate with in kabbalistic thought and practice, but the system takes place in a context that is sufficiently different from my own that it’s difficult for me to penetrate it without my entering into that context itself. In that light, recontextualizing kabbalah into Hermetic qabbalah wholesale just isn’t the best way to go about it, and to develop an even further-detached system as a Hellenic or Greek kabbalah based on the Hermetic qabbalah would be even less effective. While such a Greek kabbalah would be great for my own practice and context, being much more familiar with Neoplatonic, Stoic, and even some Pythagorean philosophy (which is really the root of much of this, anyway), trying to base it on the already “debased” (to exaggerate the sense) Hermetic qabbalah would be like a game of Translation Party. And, just like with proper English-to-Japanese translation, you need to have a good sense of the language, structure, and system you’re trying to build things into based on the ideas and thoughts you already have instead of trying to go through a predetermined middleman system with its own rules already in place. In order to create a Greek kabbalah, I’d need to start fresh from first principles. Scrying the Tree of Life in a Greek framework isn’t the only work that has to be done, but the creation of a new map of the cosmos and new paths, developing an understanding more fitting to my own context instead of that of a different religion and tradition, is all necessary. In other words, I hope you stay tuned as I work towards a Greek kabbalah. This will be a series of posts over the coming month exploring all the aspects I consider necessary to build such a system, so I hope you follow along.